Time passed, things changed. Internal combustion took the place of horses, and the demand for them almost disappeared, but cattle ranches still depended on the horse to get their job done. Some ranches were in such rough country that at times even a man on horseback could not find all the stock. There are ranches today that use airplanes and walkie-talkies to help gather stock. Eventually the horse ranch sold to a cow outfit, and Dad lost his job and began doing anything that paid wages. We got by. Then I started fooling with green colts, those that had only been broken to lead, and discovered that I had the ability, or knack, to gentle a colt and put a decent rein on him in a relatively short time. I began to get a rep as a better than average hand with a young horse, and I was told by several that there is often a form of communication between horse and rider that allows them to work together. There may be something to this notion. The place that I had inherited from Dad, and he from his second wife, made a nice place to do my horse training. I rented some land that joined me, and bought some feed, so that I could keep several colts at a time. I was making good money and having a good time besides. I told those that had colts for me to break that they must be brought to me with enough feed to for them. It was no problem for me to teach them a few things. It got to the point that if I did not think that a colt would break out to something that I could be proud of, I turned him down. There were several boys around that could break a horse to ride, if that is all that was required. About the time that I got in high gear as a horse trainer, the people that owned the land I had rented got an offer they could not turn down, and sold it out from under me. The word got around that unless I found some land, I might have to stop breaking horses for anybody. A lawyer that I barely knew hit me up one day, when I was nursing a cup of coffee at Jake's. He had a tale to tell that sounded promising. A man who had had three sections of land, about 1920 acres, a few miles out of town had passed on and left his property to his two daughters. One was married to an army officer and was stationed somewhere in the East, and the other was in college somewhere. The improvements were nothing to brag about, but would do and the lawyer thought that I could lease it for a reasonable amount. I told him that I would take a look and let him know. I had three good horses that I had picked up one way or another, so I rode one of them out see to the place. It had not been stocked for several years and the grass was good. The pens needed a lot of work, but that was in their favor. I could build them back like I wanted them. I went back to the lawyer prepared to put up a fight to get the place on my terms and almost fainted when his first price was about half of what I had decided to give. But I could only get a three year lease, with option to renew or buy. I made a deal with a fellow, who I had seen in Jake's from time to time, for two wagon loads of bundled feed to be delivered and stacked. Another fellow that I knew slightly sold me some bundled oats at a very reasonable price. Things were going my way. I had an arrangement with the local Livestock Auction to keep my horses at the barn where they were used on sale days to pen and work the stock on hand. It was making real using-horses out of them. I had it set up with the auction barn operators that I could take out one or more of my horses if I had a need for them. I took two of the most experienced out to the new place and began to get set for work. The first colt that I tried was a good-looking bay with a streak of white from between his ears to the tip of his nose. Naturally I called him Streak. Horses may be called by a dozen names before one comes along that fits. This brings to mind a farm boy that named three unbroken horses Alfonso, Emperor, and Galena. When these horses were turned into the using bunch they were renamed Mush, Flapjack and Mudball. Made no difference to them. I roped Streak around the neck and the fight was on. He dragged me for at least a half a mile. When he turned to face me, it was more with the idea of more fight than surrender. This is the way most horses are started. They are scared and the seed of fear of mankind is planted. Jesse Jones was born in Colorado City, Texas, and grew up on his father's ranch outside town. He got a good start in partnership with his father and then moved west to the hills of Canyon City, Colorado, to seek his fortune with his own ranching operation. He eventually decided that ranching in South Dakota would be more successful, so he and his family moved there and spent several years trying to make a profit on "Eisenhower calves from Truman cows" as he puts it. He eventually moved to Springdale, Arkansas, and has spent many retirement hours writing about all the interesting adventures he has had or has heard about. The computer came along in time for most of those stories to be recorded in electronic form. 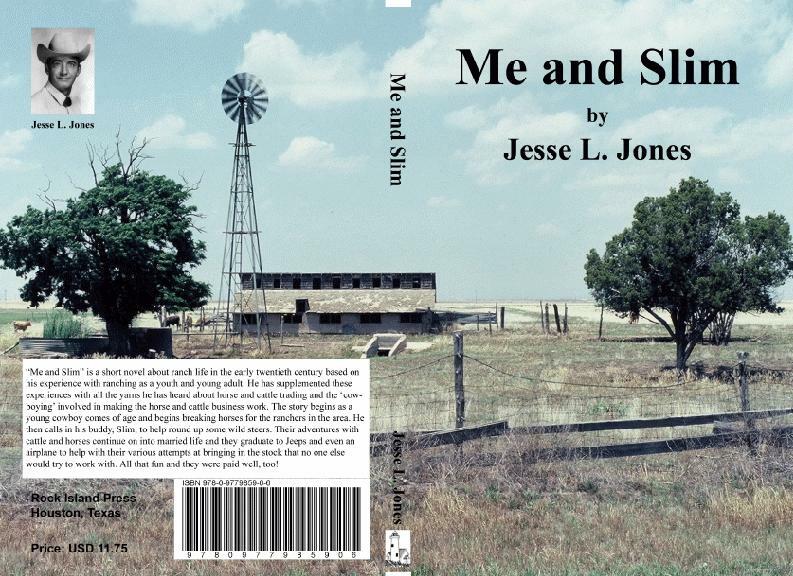 “Me and Slim” is a short novel about ranch life in the early twentieth century based on his experience with ranching as a youth and young adult. He has supplemented these experiences with all the yarns he has heard about horse and cattle trading and the ‘cowboying’ involved in making the horse and cattle business work. The story begins as a young cowboy comes of age and begins breaking horses for the ranchers in the area. He then calls in his buddy, Slim, to help round up some wild steers. Their adventures with cattle and horses continue on into married life and they graduate to Jeeps and even an airplane to help with their various attempts at bringing in the stock that no one else would try to work with. All that fun and they were paid well, too!